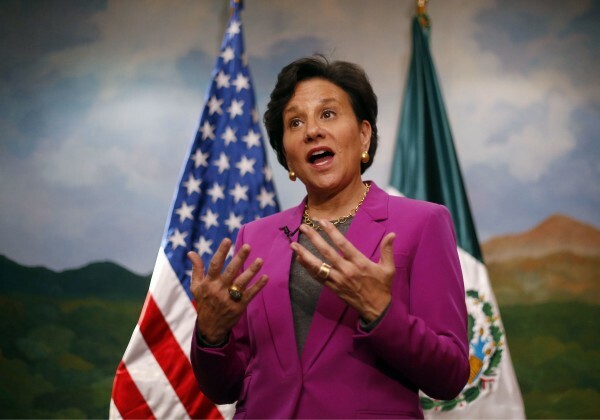 Penny Pritzker, U.S. Secretary of Commerce, gestures during an interview with Reuters in Mexico City in this February 2014 file photo. The North American Free Trade Agreement, just turned 20, has been in the news lately. Its advocates hope to extend its reach and depth through a Trans Pacific Partnership trade agreement and similar deals with Europe. Trans Pacific Partnership’s possible threat to shoe-industry jobs in Maine has properly received much attention in the local press, but NAFTA has other lessons that deserve close scrutiny. Perhaps NAFTA’s greatest achievement has been rhetorical. Agreements like a Trans Pacific Partnership are still called “free trade.” They are nothing of the sort. They employ coercive means at the domestic and international levels to enshrine monopoly privilege for key segments of the FIRE sector (Finance, Insurance, Real Estate) of U.S. capitalism. The instability and rapaciousness of deregulated finance on an international plane will likely cost even more jobs than NAFTA. NAFTA was originally promoted with classic arguments of “comparative advantage.” If tariffs on goods are eliminated, each nation can specialize in those at which it is best. Trade between nations then increases the total size of the pie. The classic theory, however, postulates underlying assumptions, such as full employment, that have virtually never applied in reality. Even if we accepted this questionable thinking, there would be even more compelling reasons to reject a Trans Pacific Partnership. Economist Dean Baker has frequently pointed out that these agreements require foreign governments to accept the terms of U.S. patent and copyright laws, in effect extending monopoly pricing power beyond U.S. boundaries. The Trans Pacific Partnership likely will add insult to injury by prohibiting Maine from importing cheaper drugs from Canada. So much for a Trans Pacific Partnership as a trade-promoting agreement. Despite the world financial crisis, frequent exposure of banker malfeasance and continued economic distress, a Trans Pacific Partnership and other like agreements may achieve bankers’ fondest hopes — an international political and legal structure that forbids effective bank regulation by domestic authorities. Experience in both Latin America and the Eurozone suggests that giving finance capital free flow — and implicit bailout guarantees — seldom encourages investment in real business. Financial deregulation leads to bank consolidation, speculative investment in land and other finite resources, asset collapses, calls for austerity, public bailouts of the largest players, growing inequality and political crisis. In such a scenario, Maine’s small business community, just as Greece’s today, dependent as it is on bank financing, would suffer greatly. Financing would dry up even for successful businesses. International trade is vital, but for trade to flourish, finance itself must be reined in with international regulations. These would include limiting leverage, capital controls, tax policies and a central bank with the resources and commitment to discourage speculation, as well as policies to prevent beggar thy neighbor trade agendas. John Maynard Keynes proposed such an agenda at Bretton Woods in 1944 but was outmaneuvered by American bankers eager to enhance the role of the dollar and encourage largely unregulated finance. Some investment banks may have benefited, but the rest of us, including thousands of Maine workers, have lost. Collaboration among labor, peasant and immigrant rights advocates on modernized reforms of the sort Keynes suggested would be an occasion to celebrate. John Buell lives in Southwest Harbor. He is a columnist for The Progressive Populist. His most recent book is “Politics, Religion, and Culture in an Anxious Age.” He can be reached at jbuell@acadia.net.